Want To Ensure Your Survival in Any Situation? Repetition is the Answer! Having a basic understanding of survival and knowing the techniques is not enough. While knowledge is a key aspect of survival, repetition is the underlying piece of the puzzle that ultimately makes the difference between success and failure. Last week we posted an article on studying the basics of survival. In that article, I mentioned how important training in those basic skills was to your survival. While knowing those basic skills is extremely important, I probably should have placed more of an emphasis on repetitive training in those skills. 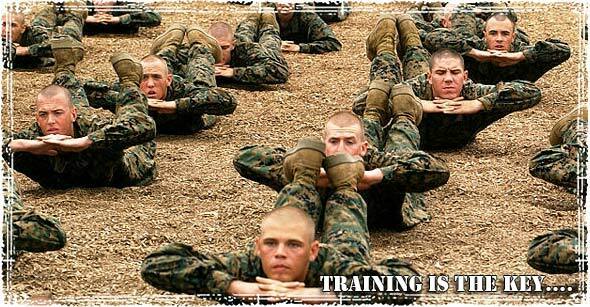 If you’ve ever trained with the Marines, you’ve probably noticed how differently they train. In my opinion, there is one thing separates their training style from most other types of tactical/survival training, and that is repetition. They spend countless number of hours training on specific skills that others might only spend a couple of hours on. Through fatigue, injury, and pain they run through their techniques over and over until they can’t fail. They are masters at what they learn, because they run through these skills again and again in a number of different scenarios and environments. They become masters because of repetition. Want to ensure your survival? To really be able to count on your knowledge when the SHTF, you need to run through your techniques in a number of scenarios and environments. Just like the Marines, you need to use repetition in your training until your skills become second nature. The more you train in real world situations, the more likely you are to be able to perform these skills when it really matters. Being able to start a fire in your back yard when it’s sunny, and you’re well feed is one thing. Being able to start a fire when it’s raining, cold, windy, and you’re about to fall over from a lack sleep is entirely different. The best thing you can do, is to use these skills as often as possible. Oftentimes people come on here complaining that they just don’t have the time to train. But in reality, even the busiest people can still find a way to fit training into their routine, it just takes a little bit of imagination. Take the fire starting example that I talked about above. Maybe you don’t have the time to go off into the wilderness; but if you barbecue on the weekends, why not use that as a time to hone up on your skills? Instead of using a lighter to start your grill, why not take a couple of minutes and start the fire with one of your fire making techniques? If you want to be a master in the art of survival, training with repetition is essential to ensuring your survival. Now this is what I can and usually do. I go through my books and try them in the basement after work. Go through my knot skills. Try to keep everything fresh in my mind. My basic training happened years ago and my boy scouts career was even further back. I try to keep everything I learned from both as fresh as possible. You hit the nail on the head. Keep doing it until it is second nature and becomes as natural as walking. Repetition is what separates the elite from the rest. I like to practice these things with my son while we are camping. I understand practicing training and also understand each plan needing a backup plan. Matches, lighter, fire starter, etc. The real key is to know how to use the items. It does you no good if you have all the best gear and food in the world if you do not understand the use of it. Yes! You had me hooked from the title. All very true. I practice the bow and hand drill once a week using different woods. Some work great and others don’t.